There has been yet another explosive development further dividing the cultural community of the Berkshires. Many endorse and others strongly oppose controversial plans, not just to sell the best works from the collection, but also to destroy the architectural character and integrity of the structure that displays them. Stating that the 40 works the Berkshire Museum plans to auction for a Sotheby’s presale estimate of $50 million are free of restrictions raises flags. While launching its “reboot” plans, a drastic attempt to save the museum from extinction estimated as eight years from now, it identified two works by Norman Rockwell. Like much of the haste, secrecy, and muddled strategies that evoke troubling questions the museum initially failed to disclose the other 38 works. Under relentless media and professional pressure the museum, stating that it can’t afford a curator, has deep pockets to hire outside public relations and marketing consultants. It is desperate to spin a fire storm of resistance and alienation from the community it is mandated to serve. Messages from the bunker uttered by director, Van Shields, and targeted board members, state determination to proceed with the sale. It is sticking to ineptly thought through strategies that entail retiring ten years of $1 million annual debt, creating a $40 million endowment (the additional $10 million raised privately), and $20 million for renovation and reinstallation. It plans to phase out fine arts and refocus as an interactive science and natural history museum. The odd lot it plans to deaccession including Hudson River landscapes, Old Master paintings, sculptures (two by Alexander Calder), and modern works on paper were acquired during another era. Donors assumed that their treasures would remain in museums, schools, libraries and institutions for future generations. It is acceptable for museums to weed out and upgrade collections through deaccessions. Often this is done behind closed doors. Visitors are surprised to find works missing or turning up at other museums. In addition to deaccessions, museums raise money by loaning works to ever more commercial exhibitions. When visiting the Frist Museum in Nashville, for example, we were surprised to see works from Boston’s Museum of Fine Arts in a show with the theme of Japanese influences on impressionism. The Frist has no permanent collection and pays for its exhibitions. The summer show of guitars at the Berkshire Museum is an example of pay-per-view programming. During the administration of former director, Malcolm Rogers, key works from the MFA collection were often on the road, for years at a time, earning their keep. With 40,000 objects, including those 40 cherry picked masterpieces, over the past six years under Shields it might have saved money by creating home grown shows and possibly sending them on the road to other museums and kunsthalles like the Frist. While Shields argues that the museum can’t afford a curator he appears to have no interest or skill in that regard. That sharply contrasts with Stuart Chase who preceded him. As an arts administrator told me it’s nonsense that the museum has been without a curator. There is a renowned museum studies program at the Clark Art Institute in collaboration with Williams College. The college has produced so many distinguished scholars, curators and museum directors that they are known in the field as the “Williams Mafia.” There is also an arts administration program at MCLA. Future curators and museum directors would welcome an internship to study and work with a rich and vibrant collection. In the manner of Harvard Business School the pressing circumstances of the Berkshire Museum would have been a hands on, case study for professors and their gifted students. All Shields had to do was lift the phone but he opted instead to call lawyers and spin doctors. In daily media coverage, it has grown as a national and international story; there has been constant shifting from support for the museum’s strategy to passionate opposition. The lurching back and forth started when Laurie Norton Moffett, the founding director of the enormously popular and well managed Norman Rockwell Museum, drew on forty years of experience, to plea for the museum to “pause.” She argued for preserving a legacy that will be lost forever. She has denied media requests for further comment. Many arts professionals who support her position applaud her courage to come forward. Following her op-ed piece the tide shifted toward pleading with the museum to rethink and come up with other strategies. There appeared to be a game changer when, in a lengthy and well reasoned critical analysis from Joe Thompson, director of MASS MoCA, he endorsed the sale, praised Shields the board and staff of the museum as good people, neighbors and friends. He called for calm stating that the museum faced no realistic alternative and had a fiduciary responsibility to save itself. Knocking home his points he urged readers to “get real” about the peril that the museum finds itself in. Tellingly, however, in two last points he expressed doubts about bells and whistles plans for interactive displays. The Thompson article appeared to be a knife in the heart of those calling on the museum to pause and reflect before moving forward with drastic and inarticulate plans. The Eagle reported that the works in question, minus two sculptures, had already left the building. Despite repeated questions the museum had uttered double talk citing security issues for works worth millions. Deeper digging suggests, however, that the works may have been transferred to the auction house even before the press conference that announced reboot plans. Why has the museum been in such a hurry and secretive about essential details? There is now another reversal regarding the “unrestricted status” of the two Rockwell paintings. Two pro and con letters by distinguished attorneys have argued for and against the legality of the sale. Just what was the intention of the artist when he gave two paintings to the museum? In rushing through its sale the museum seems intent on a slam dunk process. It has been reluctant to reveal essential documentation. An Eagle editorial has questioned what the museum is so intent on hiding? In a letter from attorney Martin Kaplan of Lenox he wrote in part “I believe The Eagle and the public have a right to review all documents that may relate to the legal authority of the museum to sell the art in question: the letters between the donors and the museum, minutes of the board discussing such issues, internal memoranda, public statements of commitment and purpose. Only a legal analysis of such material can determine if the museum indeed has the right to sell, or if it is committed to retaining certain of the art pursuant to the terms of the gift or the commitments of the museum. “For example, subsequent board minutes or internal memoranda may reflect discussions on possible sale with a conclusion that the museum could not sell one or more of the works of art. If that is so, there should be analysis of whether the museum is justified in now determining that it does have the right to sell. Without a determination of this threshold issue, it is not clear as to the museum’s legal authority to dispose of these works of art. Initially, it seemed that the Thompson letter, coming from a respected Berkshire arts leader and museum director, represented game, set, match. With the latest startling revelation, however, debate and possible legal action now appears to be headed to extra innings. An arts professional points out that Thompson has gotten some $60 million in tax payer dollars from the Commonwealth of Massachusetts. Consider that while former governor, Deval Patrick, was a Berkshire neighbor and friend there was no appeal from the board for state funded support. There were many sources and strategies never explored until the failing director and flummoxed board opted to circle the wagons. They had six years to see this coming. According to their own accounts, there were four years of $1 million annual deficits before Shields was hired based on alleged skill as a fundraiser. "Norman Rockwell didn't give ["Shuffleton's Barbershop"] to finance the museum's renovation plans," they wrote. "He gave it hoping the people of the Berkshires would see it and enjoy it." Rockwell donated both paintings to the Berkshire Museum, "Shuffleton's" in 1959 and "Shaftsbury" in 1966. While the letter singled out "Shuffleton's," the family is also opposed to the sale of "Shaftsbury," said Margaret Rockwell, manager of the Norman Rockwell Family Agency. She said the letter called attention to "Shuffleton's" because it is a family favorite and considered a Rockwell "masterpiece." The Rockwells are presenting a united front pleading to keep the two paintings in the Berkshires as the artist intended. If, as stated, the paintings don’t fit current plans then they should be loaned, sold or gifted to the Norman Rockwell Museum. 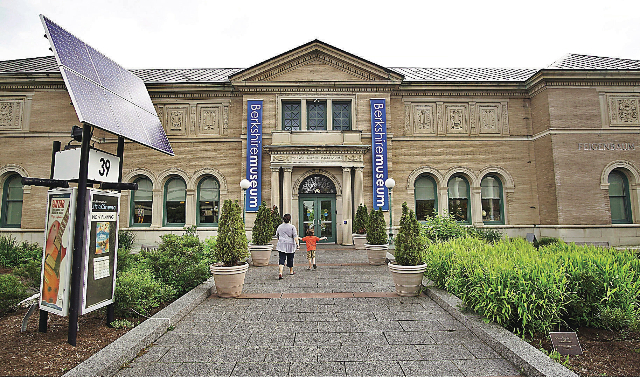 Legacy, and the artist’s will be damned, the Berkshire Museum appears only to be interested in the thirty pieces of silver it can get for iconic masterpieces that reflect the heart and soul of the region and its history. It’s time to rethink the museum's strategy. Based on the wishes the Rockwell family, and pleas from the community, those paintings must be withdrawn from the sale. The museum is determined to continue with the sale, short of an injunction. It will fall short of the targeted $50 million. Plans should immediately refocus based on revised projections. Money from a fall auction should be applied to retire debt and increase the endowment. This would allow the museum and board to survive another day and revise its fiscal and curatorial strategies. The museum must immediately hire a curator, interns or consultants to study and access the fine arts collections and how best to integrate them more effectively. Fire the current architectural team and start over. The projected $20 million renovation is a disaster. It calls for destroying the historic, art deco, Crane Room and the auditorium with its two signature Calder Mobiles. The purpose of this is to create an enormous lobby and atrium. Why not take a page from the book of leading museum architect Lord Norman Foster? He is renowned for reconfiguring historic structures- the MFA, British Museum Library, The Reichstag in Berlin- by creating glass and steel atriums. There is sufficient space in front of the museum to create just such a structure while preserving the overall historic integrity of the museum. This new construction could be created at a fraction of the cost of reuse renovation. Rethink the mission and mandate of the museum. Develop better strategies for integrating its eclectic elements. It is time to retire the plaster casts but upgrade the fine arts in a dialogue with other aspects of the collection. How do the fine arts relate to natural science, optics and other agendas of interactive education? Welcome and work with a thriving and growing community of artists, curators, critics and arts professionals. There is an enormous resource of talent in the region to tap into. As the Berkshire Museum it is time yet again to be just that. The name says it all. Become a vital resource for all aspects of our rich and diverse region and community. That is likely to increase interest, support, giving and attendance. Step away from the negative branding that says to the nation that we are an arts community that does not respect and preserve our legacy and heritage. Take positive steps by embracing all of the community and not just the 400 it interacted with behind closed doors. The museum has been exclusive and must now become inclusive. Consider a change of leadership. Is Van Shields the right person to take us to the next level? Does the current board inspire vision and confidence? "I vote strongly for a "pause" and certainly to rethink the architectural proposed scheme. The incorporation of the existing faade into a design worthy successful " building systems integration" might be as much of a challenge in science and technology/interactive future arena that the steering committee may not have considered. #5 by Charles is a strong leaning." "How would the community react if the Berkshire Museum donated the two Rockwells back to the Rockwell Museum, and put a small dent in their proposed income? Those Rockwells are community treasures. We cannot ethically afford to put them in someone's living room."